PORTLAND—Bishop Robert P. Deeley named the Rev. Frank Murray as Vicar Forane (VF) for Vicariate II in the Diocese of Portland. Rev. 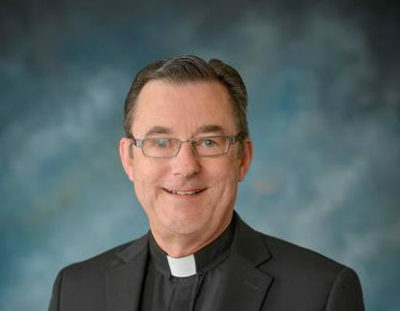 Murray is currently the pastor of St. Paul the Apostle Parish (St. John Church, Bangor; St. Mary Church, Bangor; St. Joseph Church, Brewer; St. Teresa Church, Brewer; St. Matthew Church, Hampden; St. Gabriel Church, Winterport). Fr. Murray added the title of Vicar Forane for Vicariate II on Nov. 18, 2018. The Rev. John Skehan, the previous Vicar Forane of Vicariate II, is now the Vicar Forane of Vicariate III. Rev. Skehan, who was appointed pastor of St. Michael Parish in Augusta in June 2018, became Vicar Forane of Vicariate III on Aug. 20, 2018. A vicar forane is appointed by the bishop to promote and coordinate common pastoral activity in his vicariate and to provide spiritual and pastoral counsel to the other priests in that region. The vicar forane ensures that clerics and parishes in his vicariate perform their duties diligently and collaborate for the good of the vicariate and diocese. The term “vicar forane” comes from Latin, meaning a representative (vicarious) who is outside (foras). In essence, representing the bishop outside of the cathedral city (Portland). (St. Michael Parish, Augusta; Christ the King Parish, Skowhegan; St. Brendan the Navigator Parish, Camden; All Saints Parish, Brunswick; Corpus Christi Parish, Waterville). (Good Shepherd Parish, Saco; St. Thérèse of Lisieux Parish, Sanford; Holy Spirit Parish, Wells; St. Matthew Parish, Limerick; Parish of the Ascension of the Lord, Kittery).